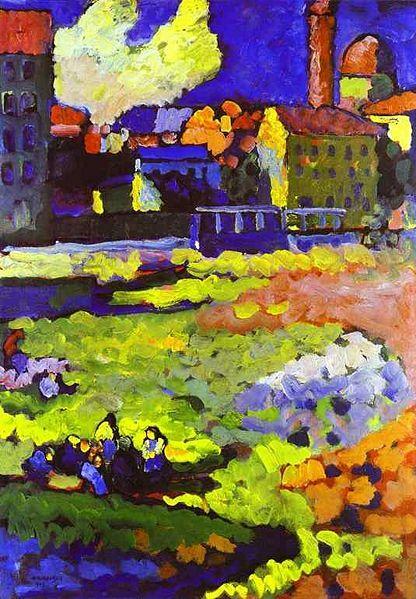 Today’s post spotlights Russian painter Wassily Wassilyevich Kandinsky (1866-1944). Born in Moscow to Lidia Ticheeva and Vasily Silvestrovich Kandinsky, he recalled being fascinated and stimulated by color as a child. He attended the University of Moscow, studying law and economics, as far from painting as the east is from the west. His interest in art began at the mature age of 30, at which point he settled in Munich, studying at Anton Ažbe‘s private school. Kandinsky compared painting to composing music, writing, “Color is the keyboard, the eyes are the hammers, the soul is the piano with many strings. The artist is the hand which plays, touching one key or another, to cause vibrations in the soul.” Check out these good vibrations. He focused on landscapes and towns, rather than human figures, except for Sunday, Old Russia (1904). 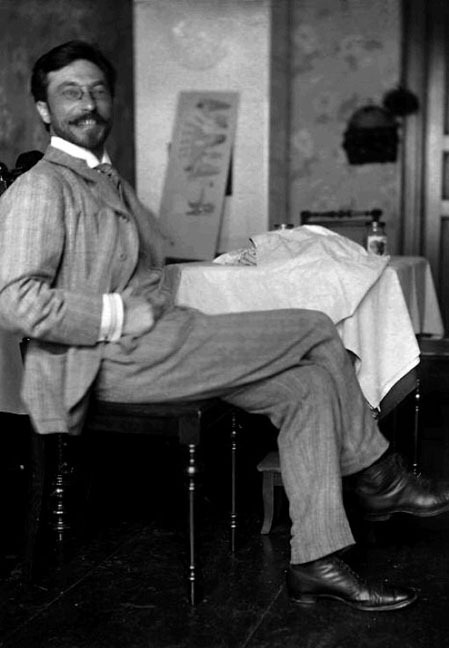 Kandinsky spent the years from 1906 to 1908 travelling across Europe as an associate of the Blue Rose symbolist group of Moscow, settling in the Bavarian town of Murnau. During this time, The Blue Mountain (1908–1909) was painted, demonstrating his trend toward abstraction. I’m not keen on abstract art, so I’m delighted that we can make out horses and riders, as well as said blue mountain. Nice as that sounds, it was time to get going. In 1921, he was invited back to Germany to attend the Bauhaus (no, not Peter Murphy’s goth-rock band) school of art, where he began teaching until the Nazis closed it in 1933. Not crazy about Nazis, he left Germany for France, where he spent the remainder of his life. 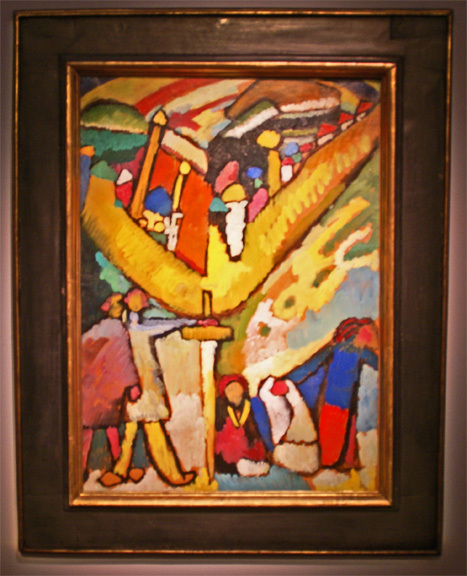 In 2012, Christie’s auctioned Kandinsky’s Studie für Improvisation 8 (Study for Improvisation 8), a 1909 view of a man wielding a broadsword in a rainbow-hued village, for $23 million. I bet that would have been music to his ears. 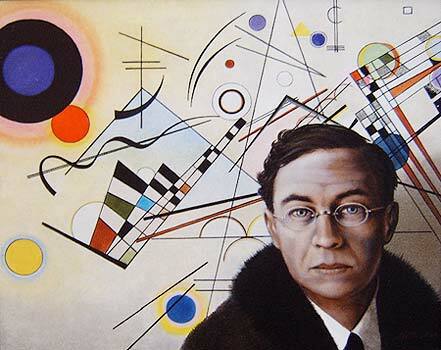 This entry was posted in humor and tagged art, Bauhaus, Kandinsky, Painting. Bookmark the permalink. This just shows it’s never too late to find or pursue your true passions! And that is always encouraging! I always liked Kandinksy, even his abstract stuff, which seemed to have warm colors and, yes, good vibrations! But these are nice ones that I mostly hadn’t seen before. Like that Munich view a lot. A lot of range here. The landscapes seem like Klimt or Cezanne or Chagall. (There, I finished my cocktail party art spiel.) Great write up! I am visualizing you holding a glass of red wine in one hand and a smart goat cheese bruschetta in the other, as you are saying this. And I’m proud of myself for knowing C & C and Klimt, if only for the everywhere-seen Kiss. I vote you the resident art critic! Well, yes. Erhem. 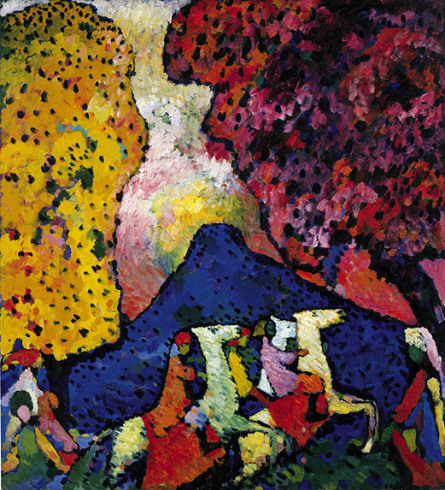 It is indeed the vivid colors of Kandinsky’s landscapes, and the soft, blurred, indistinct borders betwixt objects and planes which juxtapose so astonishingly with the, er, darker tones, linear abruptness and sharp angularity of his later abstract work, and mark such a striking change not just in subject matter but in the treatment thereof, a remarkable pivot in artistic development, yet it is the same Kandinsky and one can detect here and there the same whimsy, the same alertness, as if the abstract work were indeed landscapes of a sort, but landscapes stripped of the distraction of the recognizable and brought to the most elemental principles of light, motion, mass. Quite remarkable. Yes. His paintings look like they flicker with Christmas lights and fireflies! Joy to the world. And now I am almost certain that you have leather patches on the elbows of your tweed blazer. Please visit the Blog of Funny Names today for your Art History lesson. I think he had a great sense of color and whimsy. He certainly had his own rules of composition. I don’t think his last name was all that odd. Now his first two. That’s different. But I don’t have much room to talk. Yes, just the first two. The last is less interesting than Tim Kazurinsky. the former SNL actor who is only 5’2″. I will have to Google that. I haven’t watched SNL since 1980 something. His art is eye Kandinsky, Kerbey. Yupper. isn’t he a cousin of buttinski? Nicely done, Kerbey. Are you an art fan? I studied a bit in college the first couple of years, but have not since then. You know more than I do, I am sure. I haven’t been to an art museum in 20 yrs. Ah yes, I see he has the required facial hair stylings to go with his impressive multi-syllabic name and of course the distinguished career. Distinguished looking fellow, too. Just reading this made me want to get a monocle and a plate of the finest bruschetta. Let me grab some of my finest cognac and we shall meet in the lounge to discuss his eyewear. Splendid! Simply mahvelous! Good use of a Bauhaus reference too – I haven’t heard that band in years, but I saw them at Coachella many moons ago! Did you really? “Bela Lugosi Is Dead” would be apropos for the upcoming holiday. And another “She’s In Parties” would be fitting for Thanksgiving and Christmas as well! Wow, you’re good at this game! I love the colors in the paintings, nice eye Kandi-nsky. So cheery for fall. Nice post, Kerbey.